The Bank of England has agreed to give emergency financial support to the Northern Rock, one of the UK's largest mortgage lenders, the BBC has learned. However this does not mean that the bank is in danger of going bust, Business Editor Robert Peston says. There was no reason for people with Northern Rock savings accounts to panic, he added. The decision for the Bank of England to become the "lender of last resort" is extremely rare - and comes after consultation with the Treasury and the Financial Services Authority. However the disclosure is expected to rock financial markets, Mr Peston said. "Although the firm remains profitable, the fact that it has had to go cap in hand to the Bank is the most tangible sign that the crisis in financial markets is spilling over into businesses that touch most of our lives," he added. The Governor of the Bank of England, Mervyn King, said in a letter to the Treasury Select Committee on Wednesday that the Bank would be prepared to provide emergency loans to a bank that ran into difficulties, so long as those difficulties were the result of temporary market conditions. "The fact that the Bank of England has been prepared to act as the lender of last resort is an indication that it thinks the problems at Northern Rock are temporary ones," Mr Peston added. Treasury Select Committee chairman John McFall urged Northern Rock customers not to panic. "I don't think they should be worried about their current accounts or mortgages," he said. "The fact that the Bank is willing to act should be reassuring." The loan would be provided at a penal interest rate, he said, as a recognition that management at the firm were not without blame. Following the widespread losses made by investors in loans to US homebuyers with poor credit history, the so-called sub-prime loans, investors have become wary of buying all mortgage debt, including Northern Rock's. "All banks are having greater difficulties than normal getting funding from the market but as a specialist mortgage lender, no-one really wants to lend to Northern Rock." Mr Peston said. "It is much more exposed than its rivals to this distaste for mortgage debt, because its business is overwhelmingly focused on providing mortgages, rather than other kinds of banking business." Analyst Justin Urquhart-Stewart of Seven Investment Management said the problem was essentially about confidence in the markets. "We don't know where the poison went from all these bad loans and you have to look at all these bad loans as a bit like a blancmange that's been hit very heavily by a spade and it's gone everywhere. "They turn up in all sorts of strange funds and therefore we don't know who's got the losses." 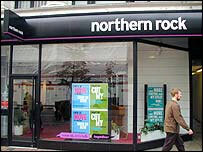 Northern Rock is the UK's fifth largest mortgage lender. In the first six months of the year, it made pre-tax profits of just under £300m, barely changed from the previous year. However it massively increased its share of the mortgage market, taking 18.9% of all net mortgage lending in the UK against its previous peak of 14.5%, seen in the second half of 2006. The firm's shares have almost halved in value this year and talk that it may be in further trouble left it as the biggest loser on the FTSE 100 on Thursday, closing down 4.9%. Northern Rock has loans and other assets on its balance sheet of £113bn. The value of deposits placed with it by retail customers is £24bn.